Dairy Tech's head designer is Peter Gray, Managing Director. Peter draws on 20 years’ experience as a dairy farmer and knows what works in the dairy and how to achieve efficient cow flow. 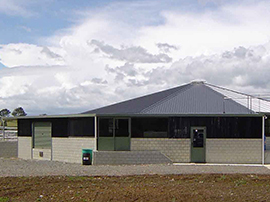 Each farm project has its own unique design requirements but there are certain design 'rules' that are applied by Dairy Tech when designing farm dairies and experience is drawn from as to what works best. Dairy Tech designs take into account cow flow and the specific demands of each farm's layout and operational requirements. 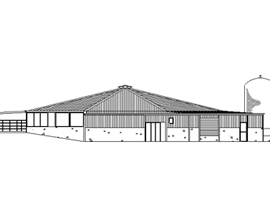 Peter Gray consults to farm owners and dairy operators working to improve cow flow design in existing sheds, modernise and install Dairy Tech components. 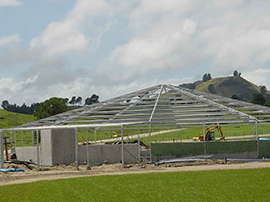 Recent projects include octagon-shaped precast “silo pads” that meet Fonterra’s updated requirements for milk vat stands. Also earning wide recognition is a sectionalised design of precast concrete underpasses that are more adaptable to alignment, height and length variations. Peter’s practical design flair has been applied to other diverse projects such as a steel-truss framed helicopter hangar and a pre-cast spiral, internal stairway for a new house. 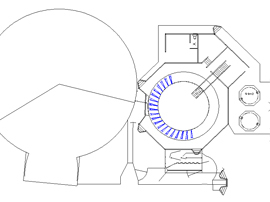 An unusual request in 2005 was to assist with the design of a revolving restaurant floor. Occupational Health & Safety consulted with Peter to review its Farm Safety Regulations for rotary dairy designs. Issues raised were the minimal, safe gap between rotary bails and head-and-breast rail, and easier access to emergency stop controls from anywhere on the platform. Dairy Tech’s team of experienced, trained personnel have the ability to repair malfunctions on site. Malfunction may require an urgent response, particularly when cows are waiting to be milked. Dairy Tech will respond and ensure the issue is resolved.